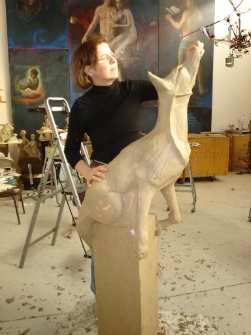 The artist using clay, wax or plastilina creates the original sculpture. 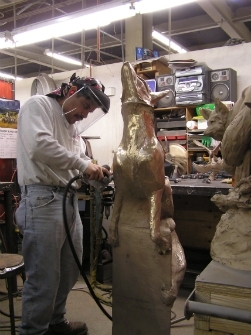 Depending on size, sculptures can be cast as a single piece or cut into pieces. 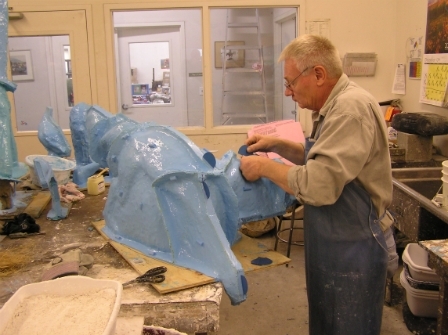 A rubber mold is made directly on to the original sculpture. 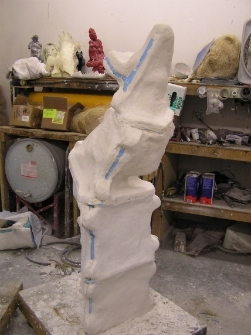 A plaster “mother mold” is made encasing the rubber. 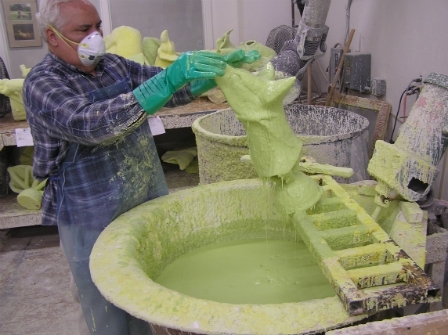 Molds are removed re-assembled, and filled with melted wax. 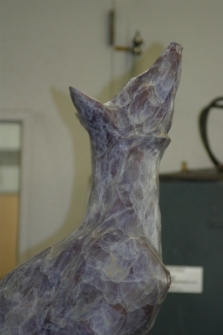 The hardened wax is removed and carefully hand-finished to replicate the original. 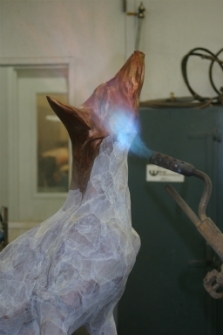 Wax rods are attached to the sculpture (called gates and sprues) in a manner resembling arteries. These gates lead to a wax funnel at one end of the rod. Hardened wax is first dipped into a liquid “shell” vat. While still wet, it is slowly lowered into a dry silica sand, forming a rigid shell. The wax, with its heavy shell coating, is now steam heated, melting out all of the wax. Leaving only a hollow shell. This is origination of the term “lost wax” or cire perdue . 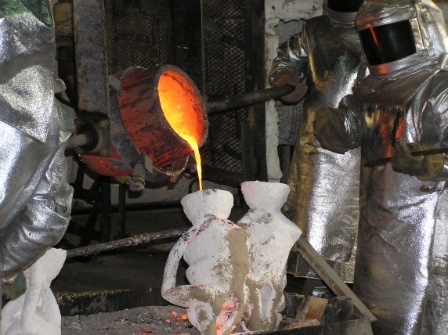 While the bronze bars are heated to liquid form, shells are baked to a ceramic-like stone. 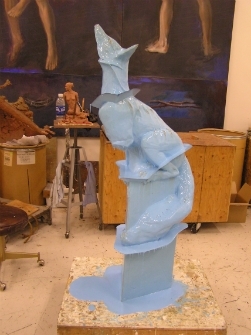 Melted bronze is then poured into the hollow cavity within the shell. 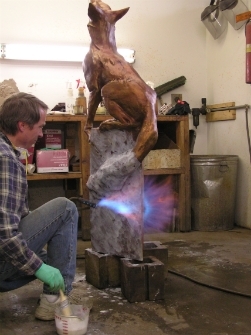 Once the bronze is cool, the shell is broken away with hammer and chisel. Bars and funnels are also removed. Any remaining shell is removed by two stages of sandblasting: first with coarse, then with fine sand. Imperfections to the surface, as well as marks and scars left when removing the bars and funnel are repaired in a process called “chasing”. 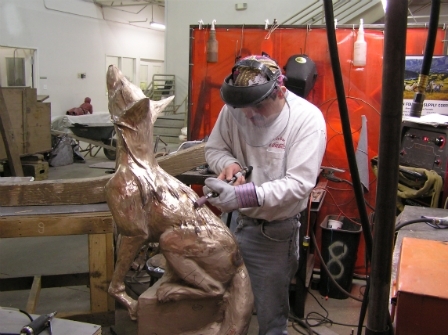 The sculpture is reassembled and welded into the correct positioning. 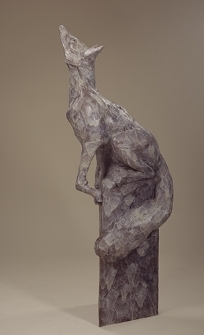 Welded seams are again “chased” by the artist until the bronze is identical to the original work. 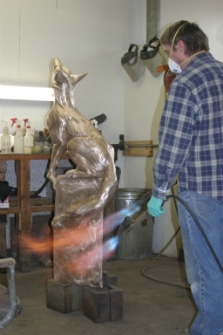 The coloration of the bronze is achieved by applying heat and chemically controlled tarnishing to the metal. Chemicals can be dipped, sprayed, or brushed on in various degrees of heat known as “applying the patina”. The process of casting is a time consuming one. These steps can represent 8-12 weeks of foundry time, and are the work of skilled craftspeople.